1) An easy to update website is essential. I like Wordpress, tolerate Drupal, and dislike Joomla. But really, I can't figure out why more non-profits and companies aren't on Squarespace. Its platform is so much easier, looks great, and saves money. Squarespace didn't pay me to say that. If your website isn't very complicated, I would move it to Squarespace or another similar platform. Save the development headache and focus on the content. 2) Website accessibility better get prioritized. Winn Dixie was sued for not having an accessible website recently. The blind customer won the case in June. Some design/development firm sure blew it. Next time they'll think about the 19% of folks with a disability in the US. You should too. Start with this guide to learn how to make your site more accessible. I'm working on improving mine this summer. 3) Values show up on your website. Whether you are aware of them or not, your values are reflected in your behavior, your communication, and your website. Do you value efficiency, honesty, relationships...or something else? What are your values anyway? How are they showing up on your website? My co-author and I discuss values extensively in our book Don't Be a Zombie: How to Refocus your Company’s Identity for More Authentic Communication. Using your values is the key to authentic and consistent communication. 4) Copying doesn't work. It makes for websites that look too similar. It's easy to look at competing companies or blogs and think, "Oooh, we should do that too." If you find yourself saying something like that, STOP. It's a terrible idea. Instead, you can see what the competition is doing so you can do something different. Seth Godin talks about this in probably half of his 25+ books. 5) The best website book still remains the same. If you haven't read Don't Make Me Think by Steve Krug, you are probably violating basic UX rules with your website. This means losing customers and readers. And don't depend on expertise of others. I know many designers and developers who violate basic UX rules all the time. Don't make people leave your website in frustration. So that's what's on my mind. Do you agree or disagree with me? And what are you thinking about this summer? I hear these refrains too often: “I’m tired.” "I'm too busy." "I'm barely keeping my head above water." In March, I spoke about zombies and content strategy at WordCamp Atlanta, an annual WordPress conference. The talk is here on WordPress TV. But what surprised me was people's interest afterwards in a document I referenced very briefly in the middle of my presentation. The document is called "20 Ways to Say No" and was written by Ramona Creel. It's perfect for people who overextend themselves. Please enjoy and use these 3 pages of ways to say no! These signs mean something needs to change. I see too many overextended business owners and professionals. Sometimes their businesses don’t thrive. Or sometimes their businesses succeed, but they have lost any semblance of serenity. What good is it to have a successful business and be stressed out all the time? Is the solution time management? Is it meditation or medication? Is it getting a coach? Maybe those things would help. It's so simple, but it can be hard to do. As small business and website owners, we need to say "no" more frequently. We should only say “yes” to the right things, such as clients that match our values and projects that excite us. Saying "no" doesn’t mean being self-centered or uncaring. It means that we can only give so much without replenishing ourselves before we crumble. My friend Rick sent me this Say "No" document about 7 years ago. It has made me a better professional and helped me become more focused. Download the 20 Ways to Say No PDF to learn how to say "no" in a gracious but honest way. And do let me know if it helps you! Too many people in both small and large organizations create a lot of extra work for themselves. They pump out content, send a flurry of mass emails, and rapidly develop services or products. I see lots of activity without enough planning, thought, or research. This often leads to poor results. Busyness isn’t productivity. In 2016, I hope you do less, not more. Do whatever you do with care, thought, and deliberation. Make sure what you are creating will have impact. Don’t create unnecessary work for yourself. How do we know they want it? How long will this take to make? Does this help us reach our business goals? Have a communication plan for this year. It doesn’t have to be long. A one page document with goals, target audiences and key messages can be sufficient. Plan what you are doing instead of taking haphazard actions. I did my communication plan for the year the other day in an hour. Download an example of a simple communication plan template here. Go for quality not quantity. Whatever you plan to do online, go for quality not quantity. With digital content, especially for professional services organizations, this will serve you well. I encourage you to have short headlines, clear navigation, and straightforward language. Keep it simple and meaningful. Dump the marketing fluff. Here are 5 ways to give your website some love. Or check out my 2015 website tips that are still super relevant. Don’t guess what the people you serve want. Talk with them, ask them, and study them. You’ll be much better at delivering items that are valued. Many companies create services or products based on intuition or false assumptions. I haven't seen it work well. Aim for joy. I hope you like what you are doing with your work life. If you don’t, what can change? Life is short, the first few days of 2016 are already gone! How are you going to spend your time? I'll be doing more UX research and content strategy this year. Let me know if I can help you. Wishing you a thoughtful, careful, and deliberate 2016! For three days after each yoga class, I was sore to the point of limping. It took me two years of classes to realize that’s not how I should feel afterwards. I finally learned that my classmates were not sharing my experience. They felt great the next day. I had applied my soccer training mentality to yoga. Push harder, go farther, do more. It worked for me in soccer. Not so much in yoga. I’m still learning through yoga 15 years later. Recently I’ve thought about how it has helped me become a better UX researcher. 1. Embrace silence. It’s fun to be immersed in a yoga class with music. But there are some things I only get from holding a pose in silence. In that silence I can give my full attention to my body. I can also watch my thoughts. I'm 100% present and engaged. When I’m conducing user research interviews, the silence before a vulnerable story is told is precious. If I break that silence, I may squelch a critical insight. I must give interviewees time to breathe and think. Silence is necessary in an interview just as white space is needed on a website. I keep my mouth shut, try to get my colleagues to shut theirs, and let interviewees do the talking. 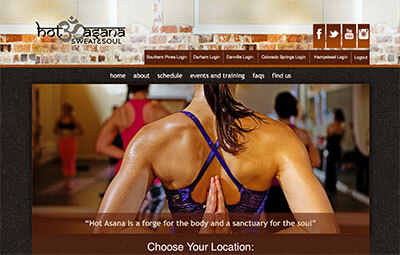 Hotasana is a great place to take yoga classes, but I'm hoping they remove their auto-rotating carousel from their homepage soon. 2. Open your mind each day. My yoga teachers remind me that just because I could do a pose yesterday doesn’t mean I can do it today. And if I couldn’t do it yesterday, perhaps today I’ll have a breakthrough. I must drop my preconceived ideas of what yoga practice will look like on any given day. When I get on my mat, I approach the practice with a curious and open mind. I don’t know how body will feel and what I will learn that day. Likewise, when I'm interviewing, I aim to drop my biases and assumptions as much as possible. Maybe this feature isn’t in fact the right one to build next. Perhaps the website doesn’t need a total reorganization. Maybe that obnoxious stakeholder does have an excellent point. 3. Care for yourself. It’s not anyone else’s job to take care of me. It’s my job. I’m 40, not 4. Yoga teachers remind students to listen to their body and modify poses when necessary. Yoga isn’t a “push through at all costs” type of activity, it’s mindfulness practice. I can apply this to my work. If I’m overwhelmed, tired, hungry, or angry, I need to care for myself and stop working for a bit. The UX project isn’t going to improve by “powering through” it. If I step away from the project, the next indicated step may become clear. I also need to be in good health, mentally and physically, when I am interviewing users in order to do my best work. Getting enough sleep, taking care of bodily needs and preparing ahead of time are all necessary to succeed. 4. Practice for progress, not perfection. Yoga isn’t about achieving the perfect pose. I don’t really believe there is a perfect pose anymore. Yoga is about practicing, growing, stretching, strengthening, caring, and calming. The goal is progress. The same is true for UX. People and devices are dynamic—perfection will always be elusive. In my job, I focus on testing UX websites or apps so we can figure out what is and isn't working. We can then make informed design decisions. Hopefully with each new adjustment, we make progress toward improving the UX. I have much more to learn, both about yoga and UX, so I’m going to keep practicing daily. What are you practicing each day? As much as I dislike the cold weather, when snow falls, we all slow down here in the South — and that I secretly love. We have to pause because most of us don’t have experience driving in snow, and our area isn’t well prepared for “wintry mix” or serious snowstorms. There’s usually a flurry of activity at the grocery store in the 24 hours before a storm, but then a hush falls over the town I live in. There is great value in this forced slowing down. When I think about websites, content and technology, I deeply believe the best experiences don’t come from hurrying. I’m not just talking about the final results — perhaps a beautiful, responsive website — but also the process for the people who create these things. This is written on top of my digital to-do list. When I’m hurrying to create content, it’s not fun. It's evident in the final product. I do better work when I listen, consider, reflect, reconsider, then act. Especially on social media, it can feel like lot of pressure to produce things quickly – for example, another blog post or more tweets. “Don’t just sit there, do something!” sometimes seems to be the message. Smashing Magazine who only emails me once a month with a newsletter. I look forward to it because I know it will have thoughtful, interesting and useful content in it. Twitter member and usability expert Steve Krug tweets every few days or less. I like reading what he tweets out, and I don't need him to tweet 5 times a day. Much of the time on Twitter and other online spaces, there are organizations and people spewing information about nothing of value. If I came across these overly talkative folks at a party, I would likely scoot to the other side of the room. Now you can be that person at the party who talks all the time to hear themselves talk, or you could be the person who speaks up less frequently, more deliberately and more thoughtfully. At least for many professional service businesses and organizations, the second option may serve them best (e-commerce might be another story). I value those people who are ok with the silence and the slowing down, who trust that frantic activity isn’t going to make our websites better or our lives better or the whole world better. I vote we slow down more frequently to do more impactful work and have more meaningful conversations. We can make this world a better place to be. Like many others, I spend a lot of time in front of a computer screen. It's increased since I've begun freelancing since I do more work and have less meetings in person than before. But I've been noticing something cool: The less time I spend sitting in front of my computer, the more things I get done in a day. I'm getting a ton done by working in 60 - 120 minute intervals instead of trying to power through 3 or 4 hours straight. Sometimes I break to meditate, to go to the gym, to take the dog for a walk, or to step out of the coffeshop to phone a friend. It works! 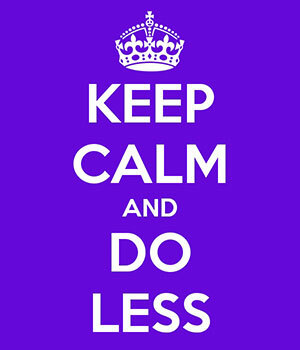 Higher productivity, less stress. Want to learn more about this topic? See this NY Times article on mental concentration and taking breaks. And let me know if you've had the same experience or something different! Now for a longer break for the holidays! My productivity and focus increased by about 40% after I meditated for 20 minutes today. In a short period, I wrote a bio for one website, finalized the schedule for a new website project, thanked a referral source, and did some research. And I had fun doing it. That is all. Om!